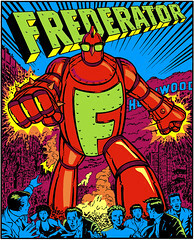 The Frederator Studios Blog: New postcards, Series 5. Five nominations for Frederator & Nickelodeon. We've become so addicted to our postcards series that we start feeling withdrawal pains if we aren't mailing out new ones. So with these reminders to vote in the upcoming election, Frederator Studios officially inaugurates our Series 5 cards, 75 in all, to be sent out over the next year or so. As has become our custom, each card will have editions limited to 200. My name is Mark Z-Man. I talked to Steve Heller at The New York Times yesterday and he said I should contact you in regards to looking at some of my artwork. I am a cartoonist and an illustrstor.